See When a Quibids Auction Will Lock BEFORE it Has – No More Wasted Bids! With the rollout of Quibids new “locked auctions” the more experienced Quibids players thought winning on Quibids would become more difficult…this couldn’t be further from the truth! 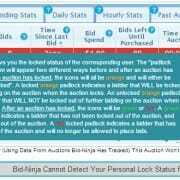 Bid-Ninja rolled out a truckload of new features that actually make winning on Quibids in combination with these new locked auctions even easier than it has ever been before. This video demonstrates just exactly how that’s possible. Now not only will you know when a Quibids auction will lock before it does, but you’ll also be able to see which bidders have and haven’t been locked out of an auction after it locks AND you’ll see which bidders will and won’t be locked out before an auction actually does! Knowing when a Quibids auction locks before it does means that you don’t need to waste bids trying to prevent yourself from being locked out. You can now just pop into an auction just before it’s going to lock, place a single bid, and then when it locks you won’t be locked out! 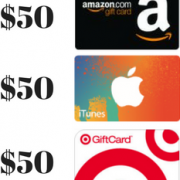 In addition, knowing who will and won’t be locked out means you could, for example, compare two auctions of the same type (say, a $50 gift card) and you can check which one will have less eligible bidders left in it after it locks. Would you rather play in an auction against 15 bidders or in an auction with only 8 eligible bidders? The latter of course! Using Bid-Ninja you’ll be able to see that! You can check out the detailed screenshots of all the new Quibids/Bid-Ninja locked auction features we’ve added to make your life of winning on Quibids even easier on the linked to blog post. So go ahead, get your piece of the action and get Bid-Ninja today! https://bid-ninja.com/wp-content/uploads/2017/08/bn_logo300x50-300x50.png 0 0 Bid-Ninja https://bid-ninja.com/wp-content/uploads/2017/08/bn_logo300x50-300x50.png Bid-Ninja2013-12-12 19:20:292014-03-13 21:08:34See When a Quibids Auction Will Lock BEFORE it Has - No More Wasted Bids! QuiBids is Giving Away a CAR for Free!